MOSCOW – Some recreational vehicle sites in Latah County could be getting a little more accessible if a series of grant requests are filled this year. Latah County Parks and Recreation Director Andrew Grant said the county has applied for three grants through the Idaho Department of Parks and Recreation to replace existing picnic tables with new tables designed to meet Americans with Disabilities Act standards and increase the size of the concrete pads underneath the tables, replace garbage cans and repair concrete-surrounded restrooms. The grant requests would make improvements at Robinson RV Park outside Moscow and Moose Creek Park west of Bovill, and create RV sites at Spring Valley Reservoir, located off State Highway 8. Grant said each of the projects have individual requests, but the goals of each are the same – to provide increased opportunities for people to stay at and enjoy Latah County’s outdoor parks. “All of the projects are based around increasing access and opportunity for everybody,” he said. The proposal at Robinson Park involves replacing five picnic tables with ADA-compliant tables and pouring a new concrete pad that is large enough to accommodate the turning radius needed for wheelchairs. The compliant tables would be taller and about 2 feet longer at one end to allow a wheelchair to easily fit underneath. The grant request is for about $23,500 from the state, with a $1,200 local match. “It only makes sense to go with ADA-compliant picnic tables if we’re going to replace them,” Grant said. Existing concrete pads – two of which are cracked – would be removed and relaid, making them about 50 percent larger and flush with the ground. Grant said he thinks the RV park can be compliant with only one ADA-accessible site, but he doesn’t want to risk having that spot occupied if someone else also needs ADA accommodations. Similarly, a concrete apron will be added around the bathroom’s existing foundation to make it level with the ground. The concrete was once flush with the ground, but Grant said time and use have made it uneven. While the difference may be all right during the summer, Grant said, the grass gets “spongy” when it’s wet and can make it more difficult to navigate. The other aspects of the grant request include replacing wooden trash receptacles with narrower, metal cans that are easier to open and close. The RV sites will also extend about 20 to 25 feet, making them about 60-foot sites. Grant said the park was developed about 25 years ago, and the RV standards have changed since then. He has heard concerns about increasing the site length because it will attract larger vehicles, but Grant said those vehicles already stay at Robinson Park. Extending site length also goes back to Grant’s efforts to provide opportunities for all people to stay at the park. He said the county doesn’t want to discriminate against any park users. The park has about 600 user-days – days when an RV is occupying one site – each year. A similar grant request of $36,625, with a $1,930 local match, was made for Moose Creek Park. Grant said the proposed project for Moose Creek involves making five of the approximately two dozen RV sites ADA accessible, with new picnic tables and improved access to bathrooms. The specific lots will be identified if the county receives funding for the project. “Out of all the sites, some are already going to be a little more level and have more space (for the ADA improvements),” Grant said. The project involves fixing concrete pads surrounding three of the six restrooms. Grant said the request also includes adding nine three-can metal trash receptacles to replace older ones. The new trash cans are animal-resistant and sturdy to help prevent garbage from being strewn around. Moose Creek has about 875 user-days each year and is often a destination because of the fishing and scenery, Grant said. 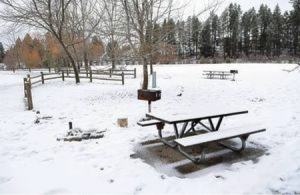 The final project involves developing RV sites at Spring Valley Reservoir, which Grant said was part of a long-term plan established by the Idaho Department of Fish and Game before Latah County took over management of the campground last spring. The fish and game department still manages the lakes at both Spring Valley Reservoir and Moose Creek, and recently updated the docks at both locations. Grant said there is a demand and need for RV sites at Spring Valley because people are already visiting the site in their campers and parking either in the gravel lot or in spots designed for tent camping. The project involves creating a designated RV area with 10 “pull-through” sites to eliminate the need for vehicles to back into the spots. If the RV site is developed, Grant said it would also be made to be ADA-accessible and to provide proper RV amenities. He has also heard concerns from residents that adding RV sites to the reservoir area will detract from the experience, but Grant said he thinks creating a specific area for the vehicles will be less distracting than having them park at other areas around the lake. The grant request is for $289,278, with a $3,000 local match, and would include a topographical survey to determine what can be done to construct the sites. Grant anticipates getting word on the requests in May. If the county receives funding, construction at Spring Valley would start in July and take about a year to complete. Work on the improvements at Moose Creek Park and Robinson Park would likely occur this summer and fall, respectively. Rudd may be contacted at erudd@lmtribune.com or (208) 791-8465. Follow her on Twitter @elizabeth_rudd.